Culling animals is an important instrument in fighting infectious animal diseases. To prevent the spread of infectious diseases, from the viewpoint of animal welfare and to prevent infection of humans through contact, animals are preferably culled in the poultry house. Until now, the only available and generally acceptable method was to use CO2 gas. 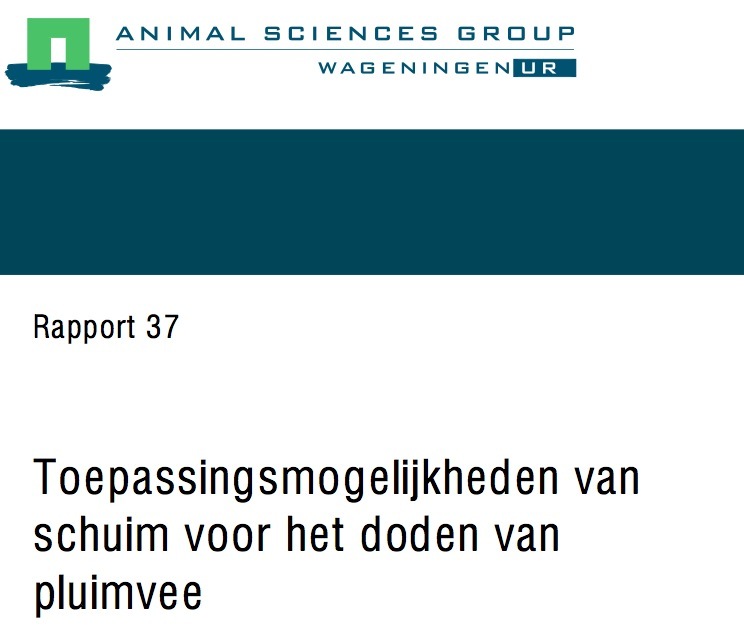 For poultry houses with a construction unsuitable for gassing, in the Netherlands probably < 30%, methods are being investigated to depopulate the poultry house with minimum human-animal contact. Using foam to cull the animals is a possible acceptable alternative. Foam can be used in various densities and using various types of gas as a carrier. High-density foam will kill the animals through suffocation. This method is permitted in the USA but suffocation is objected to in the Netherlands from a viewpoint of animal welfare. Adding CO2 to the foam, if the CO2 is released to a sufficient extent and the foam causes no obstruction to the respiratory system, could be an acceptable alternative. However, no form of scientific research has supported this until now. From the viewpoint of human safety it is essential to avoid or minimise human-animal contact as much as possible. Foam can be used in a simple way with minimum use of personnel so that any contact with the living animals is very limited. In addition, adding foam and therefore moisture will result in a reduction in the amount of dust. If detergents or disinfectants with a virus destroying working are added this can contribute substantially to reducing the virus pressure. It can be stated in conclusion that using foam to cull animals can be a major alternative to depopulation through gassing but that the consequences for animal welfare have not yet been fully investigated. The minimum human-animal contact and the possibilities for (partial) decontamination are important motivations for further studies into this method. – There must be no negative effects on the environment. – It must not hinder or render depopulation and culling impossible. – What are the effects on animal welfare; rapid unconsciousness; cause of death. – Which types of foam do not cause irritation and are safe for the environment. – How quickly is CO2 released from the foam (animal welfare). – What are the effects on the depopulation process; wait time before the foam has biodegraded; amount of water in the poultry house. – Is it possible to reduce the virus pressure in the poultry house and on organic material.